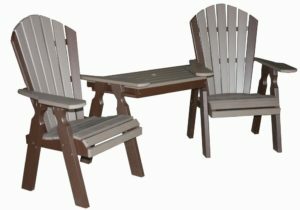 CREEKSIDE – Classic Dining Tete-A-Tete Table and Chair Set – Chairs – 22 inch chairs with a functional table attached between both chairs. Table slides out for easy transport or to use as individual chairs. Table Dimensions 24 inches x 17 inches x 38 inches. (C114).